The fourth edition of Counseling Families has undergone a substantial revision. As in the prior editions the text is concrete, pragmatic, and relevant to aspiring family therapists. The foundation to the family therapy section is a training process that links individual and group counseling theories and practices to those used in marriage and family therapy. Readers will build their core counseling skills to begin implementing specific family systems intervention models. This edition continues to help students link some of these family systems therapies with psychodynamic, cognitive-behavioral, and humanistic theories. New to the fourth edition is a focus on the recent developments in the profession. 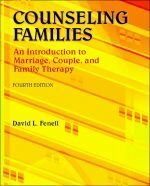 Discussion on the evolving definitions of marriage and the family and the controversies that have emerged from these definitions enhance the family therapy section. Additionally, there are two new chapters in this edition. One chapter advances important skills to prepare competent family therapists. The other new chapter focuses on counseling military families and the demand for marital and family therapy services for returning veterans and their families.